The sergeant’s halberd and the officer’s pontoon survived as symbols of rank well into the Napoleonic Era. Pikes and most similar pole weapons disappeared from European armies by the early 1700s. After all, bayonets let each man convert his flintlock into a pike that fired bullets. Nonetheless, 18th-century officers and sergeants still carried archaic-looking bladed weapons attached to six-foot-long shafts that seemed more appropriate to the Middle Ages than the Age of Enlightenment. Halberds and spontoons represented military rank just as much as epaulets, gold braid, or other insignia, with the additional benefit of serving as emergency weapons in dire situations. Halberds appeared by the late Middle Ages. The halberd’s origin, or its evolution from earlier battle axes, is obscure. Some Georgian-era antiquarians traced the weapon all the way back to the ancient Amazons of classical mythology. Other sources called it “the Danish axe” and credited its invention to the Vikings. In documented history, Swiss soldiers fighting for the independence of their cantons or as international mercenaries made the halberd famous in the 14th century. Halberds were mounted on sturdy poles about six feet long, which were crafted from ash or similar hardwoods. The iron head had a pointed spear tip with two additional blades set at right angles to the central axis. One of these side blades resembled a hatchet head, and the other was a sharp, downturned fluke or hook. The hatchet blades often were small and crescent-shaped and could have elaborate contours and pierced decoration. On the other hand, some halberds had a monstrously large axe added to one side. Those designed for combat were usually sturdy and simple, while those with the more elaborate patterns were carried by honor guards and palace sentries. The halberd’s pointed tip fended off opponents, as would a simple pike. The sharp point could puncture chain mail or slip between plates of armor. The curved fluke could catch a horse’s reins or pull riders down from their mounts. By swinging the six-foot-long wooden handle, the axe blade landed with considerable power on the armor of a dismounted knight. Halberdiers were vulnerable when swinging their weapons back to deal a blow. They were also at a disadvantage against soldiers carrying much longer weapons, such as lances or full pikes. In practice, armies mixed halberdiers with soldiers bearing pikes, bows, and other weapons. 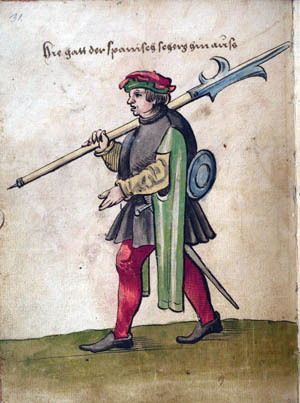 A Spanish soldier carries his halberd in a period illustration from 1530. The introduction of the harquebus in the early 16th century heralded the demise of the halberd as a battlefield weapon. Halberds also helped soldiers climb up steep slopes or defensive obstacles. The sharp axe-like blades were also handy for hacking and tearing down field fortifications such as fascines or gabions. Deploying their formidable infantry with a mixture of halberds and pikes, the united Swiss cantons during the 14th and 15th centuries defeated several Burgundian and Hapsburg armies. In 1386, Duke Leopold of Austria and many of his troops were killed by the halberd when the Swiss routed the Hapsburg army at the Battle of Sempach. At the 1477 Battle of Nancy, the halberd-wielding Swiss destroyed the army of Charles the Bold, the Duke of Burgundy. The duke was killed, his head split by a halberd. This catastrophic defeat finished Burgundy as a major power, and its lands were absorbed by the Hapsburgs and the French. European monarchs, well aware of the effectiveness of Swiss troops, hired Swiss mercenaries and also adopted the halberd for their own armies. In 1480, Louis XI of France founded a mercenary company, le cent-Suisses (The Hundred Swiss). Armed with halberds, they served as a palace guard as well as accompanying French kings on military campaigns. In 2012, the remains of King Richard III of England were exhumed from beneath a parking lot. Extensive forensic examination of the royal skeleton found evidence of multiple wounds evidently sustained at the 1485 Battle of Bosworth Field, where the king was slain. Scientific analysis indicated that it was quite likely that Richard III’s fatal wound was inflicted by a halberd. The heyday of the halberd ended in the early 1500s. Swiss troops, who were heavily dependent on the halberd, were decimated by French artillery at Marignano in 1515. A Swiss army hired by the French met a similar fate at La Bicocca in 1523, their halberds and pikes no match for Spanish infantry armed with the arquebus. In 1525, the Hundred Swiss were killed to the last man in a vain attempt to save Francis I from capture at the Battle of Pavia. Fading as a battlefield weapon, the halberd stayed in military usage as a symbol of a sergeant’s rank. Gervase Markham wrote in 1625 that in England “halberds doe properly belong to the serjeants of companies.” For two centuries, halberds were closely associated with sergeants in European armies. Havildars, the equivalents of sergeants in the Indian companies of the army of the British East India Company, also carried them. Expressions such as “to get a halberd” meant receiving promotion to sergeant. By the late 17th century, if an English sergeant was demoted his dishonor was intensified by the confiscation of his halberd in front of the assembled company or garrison. Because they could serve as measuring rods, halberds were useful for surveying the layout of a new camp. In a more macabre function, halberds were used to drag the dead from the ranks during a battle. Some armies allowed sergeants to strike soldiers with the staffs of their halberds. For more formal punishment, sergeants tied halberds together to form makeshift whipping posts. Often, three were placed together as a tripod, while the prisoner was lashed to the staff of a fourth halberd tied horizontally across two of the other ones. In the British Army in the 18th century, to be “brought to the halberds” meant to get a flogging. British sergeants used the versatile halberd to straighten their formations, set distances between the ranks, and prod men into line. Sergeants of British grenadier and light infantry companies carried fusils instead of halberds. But, in battalion companies, sergeants carried halberds until 1792. In that year, sergeants took up pikes or spontoons. One of the first weapons ever captured by American troops was a halberd. On July 1, 1775, a party from the new Continental Army made a predawn raid on the British lines outside Boston Neck. Driving away some redcoats, the patriots set fire to a guard house and carried off some spoils of war: two firearms, one drum, and one halberd. However, halberds otherwise are little mentioned during the American Revolutionary War. While spontoons found use among the Continentals, the British while fighting in America put aside their halberds, and the Americans never officially made use of them. Even today, a few special units of European soldiers are equipped with halberds. When the Swiss Guard of the Vatican was founded in 1506, such weapons were standard issue for foot soldiers. Members of the same unit, attired in Renaissance-style uniforms, still carry halberds today. Other modern halberd bearers include Spain’s Royal Guards and two British units: the famed Yeomen Warders (i.e., Beefeaters) who are posted at the Tower of London, and the Yeomen of the Guard, who serve as royal bodyguards and ceremonially open Parliament. Spontoons (also spelled “espontoons”) appeared later than halberds, coming into use in the late 17th century. The word seems to come from the Italian spuntone, meaning “pointed.” A spontoon’s iron point, sometimes decorated with tassels, was fitted to a sturdy hardwood shaft measuring from six to nine feet in length. The weapon’s distinguishing feature was a sort of crossbar, sometimes plain and sometimes elaborately ornamental, perpendicular to the main blade. Spontoons may have evolved from earlier spear-like weapons called pertuisanes or partisans. The partisan had a large blade, sharp on both sides. The blade was wider at the bottom, where twin symmetrical blades of various shapes sprouted from the sides. Rather blurry lines separate the spontoon and a number of other spear-like staff weapons. 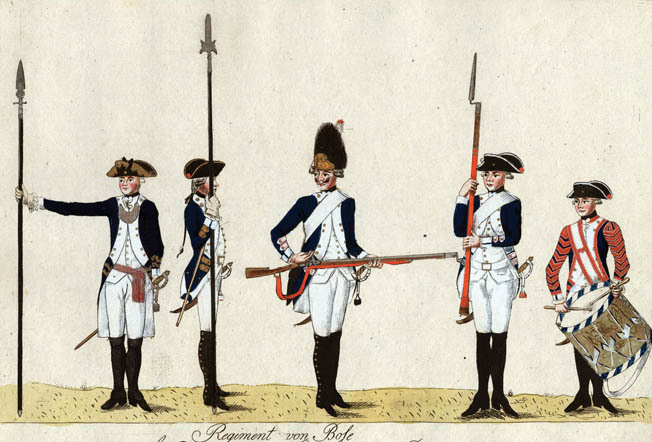 There were hybrids known as “partisan spontoons,” and some 18th-century European accounts refer to officers’ weapons as partisans rather than spontoons. Other sources refer to spontoons as “half-pikes,” and some simply call them spears. Never primarily intended for combat, the spontoon was introduced to armies as a new symbol of officer rank. They appeared in France in 1690, with new military regulations requiring infantry officers to carry an espontoon. After 1710, junior officers carried fusils instead, but senior officers retained their spontoons until the French Army abandoned them in 1756. Following the French example, the infantry officers of Spain carried spontoons between 1704 and 1768. Many foot officers of Great Britain, Prussia, Austria, Russia, and other European countries also used them, although in some armies officers of grenadier regiments carried fusils instead of spontoons. Prussian officers hold various types of spontoons. At left is a traditional spontoon and at right is a hybrid best described as a partisan spontoon. In drill formation, officers saluted with their spontoons, and they could also convey orders with them. Standing one vertically on the ground indicated a halt. Tilting the point forward signaled a forward movement; tilting it backward ordered a withdrawal. Although ornamental, spontoons nonetheless were deadly weapons. Numerous accounts mention their use at the Battle of Culloden in 1745. Captain Lord Robert Kerr of Barrell’s Regiment (4th Foot) speared a charging highlander with his spontoon before he was cut down and slain moments later. In America’s wilderness, many professional officers saw long pole or staff weapons as useless impediments. Before his ill-fated 1755 march that ended in the disastrous defeat at the Battle of the Monongahela, Maj. Gen. Edward Braddock ordered his sergeants and officers to leave their spontoons and halberds behind. Halberd-carrying British sergeants exchanged their traditional weapons for a spontoon or half-pike in 1792. Thus, these staff weapons appear in accounts of battles in the Napoleonic Wars. 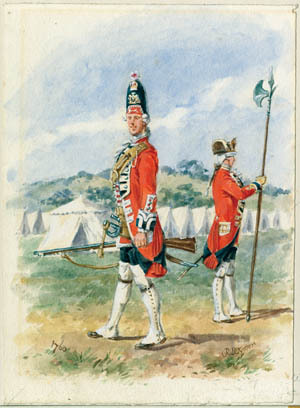 Sergeant’s pikes or halberts were at the center of desperate clashes over regimental flags and French eagle standards. At the Battle of Barrosa on March 5, 1811, Sergeant Patrick Masterson of the 87th Regiment of Foot used his pike to kill a standard bearer of the French 8th Regiment of the Line. Masterson captured the first Napoleonic eagle taken during the Peninsular War. At Salamanca on July 22, 1812, two French eagles were taken. One, seized by the 44th Regiment, had been detached in vain from its staff by a French soldier trying to hide it from capture. The British fastened their prize to a sergeant’s “halbert” and held it aloft on its new staff. At the Battle of Waterloo on June 18, 1815, Lieutenant R.T. Belcher of the 32nd Regiment of Foot picked up the regimental colors when the regiment’s ensign was wounded. Nearby, a French officer had his horse shot from under him. The Frenchman charged Belcher and grabbed the staff, but the British lieutenant managed to grasp the silk cloth of the flag. In a moment, the French officer started to draw his saber. Before he could get the sword from his scabbard, a color sergeant of the 32nd named Switzer impaled the Frenchman with his halbert. In the armies of Russia and some German states, the spontoon survived into the first decade of the 19th century. 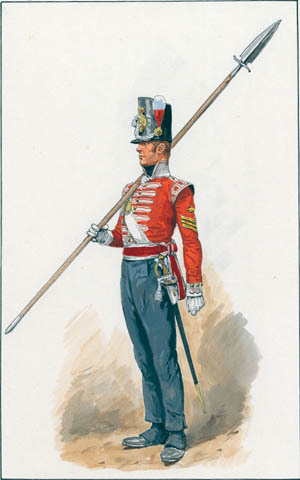 After the end of the Napoleonic Wars, the British Army did away with the sergeant’s pike in 1830. This British sergeant with a spontoon would have been a familiar sight during the Napoleonic age. In America, spontoons held on into the early Federal period. A North Carolina militia law of 1787 required infantry officers to carry “side arms or a spontoon.” Because militia officers might well wear civilian clothing, a spontoon or sword served as an indication of superior rank. The U.S. War Department ordered 120 spontoons for its officers in 1800. Captains Meriwether Lewis and William Clark each carried one during their transcontinental expedition of 1804-1806. Both officers would have reason to be glad they were burdened with these heavy staff weapons. In what is now Montana, on the night of May 26, 1805, Lewis nearly stepped on a rattlesnake. Guided by the sound of the rattles, Lewis stabbed about in the dark with his spontoon until he killed the snake. Three days later, Clark killed a wolf with his spontoon. Lewis’s spontoon would twice more save his life, once in driving away a bear and another time when the captain saved himself from falling 90 feet from a precipice by bracing himself with his weapon’s long staff. Lewis and Clark may have been the last American military officers to get any real use out of the spontoon. Watchmen and policemen in some cities carried smaller versions of spontoons until about 1860, but by the time of the War of 1812, they had essentially disappeared from military life. However, William T. Sherman, in an 1890 article in the North American Review, pointed out that U.S. militia laws still on the books stated that “each commissioned officer shall be armed with a sword or hanger and spontoon.” So, strictly speaking, all militia officers without spontoons were in violation of Federal statutes until the militia laws were revised in 1903. Tags American, American Revolution, arquebus, artillery, Austria, axe, Axis, Battle of Corunna, Battle of Culloden, Battle of Pavia, Battle of Waterloo, battlefield, Bicocca, Britain, British, British Army, Cata, Charles the Bold, CIA, Conquistador, Continental Army, Duke of Burgundy, during the american revolution, Dutch, East India Company, Edward Braddock, England, Europe, France, Francis I, French, general, George Washington, German, Great Britain, grenadier, india, Jacobite, lance, light infantry, london, military, Militia, napoleon, napoleonic war, Napoleonic Wars, omaha, OSS, partisan, Pavia, Pequot, pike, POW, Prussia, Prussian Army, Richard I, Richard II, Richard III, Russia, SAS, Scots, Spain, spear, swiss army, sword, swords, Tern, the american revolution, the american revolutionary war, The Division, the revolutionary war, Tory, Tower of London, Troy, Valley Forge, Vatican, Viking, waterloo, weapons, weapons during the revolutionary war, WIN, wounded.